Letterpress is here! Oh the matriarch of the print world you are so regal. 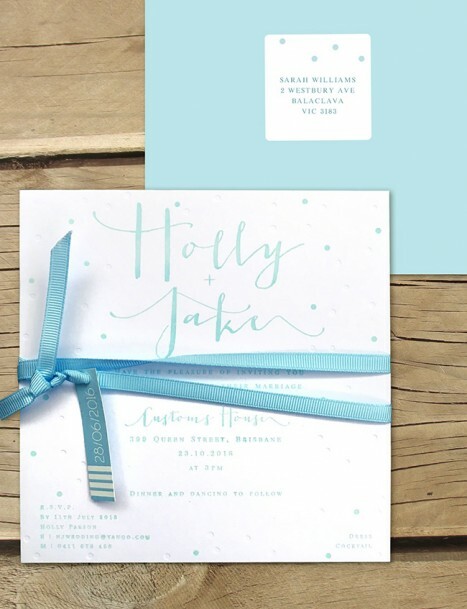 As one of the oldest techniques around, we are so please to offer you letterpress so you can have these stunning wedding invitations for your day. Looking so cute here in this design, we are loving the mix of the modern calligraphy, friendly font with the letterpress and look closely to see the blind embossed dots. Augh so subtle but they are so stunning in effect. Less is more here. With a new plate made each time, letterpress is a technique where the impression is left pushed into the card - it feels and looks so scrumptious having your names and text pushed in with all the variations of raised surfaces, it truly is the timeless classic that is perfect for wedding stationery. Printed on a gorgeous super thick 700gsm card stock, which is a fluffy white cotton - it just doesn't get any better! We can do any colour here you want, and match up the envelopes for no extra fee. We can do matching rsvp, wishing wells, menus ad an other items you need as well - just ask us for a quote! Order a sample as you really need to feel these divine ridges and the textures involved with letterpress to experience the beauty, no justice has been done here by the photography - these stars are a million times better in real life!